We are thrilled to welcome Laurie Zacharias to E-Power Marketing as the newest member of our online advertising team. With Bachelor’s degrees in both Communication and Information Technology, Laurie brings a plethora of digital marketing experience to our agency. 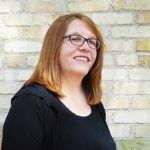 Thus far in her career, she’s worn many digital marketing hats, including fine-tuning Google Ads and other pay-per-click (PPC) accounts, designing websites for a local IT company, managing search engine optimization programs, conducting online business reputation monitoring, and copywriting. Before making the leap to E-Power, she focused on search page results by comparing search terms with website content quality and grading web page usability. On top of all that, she is certified in Google Ads, Google Analytics, and Hootsuite! At E-Power, she’ll be working to create, manage, and fine-tune digital advertising programs — which is something she’s really passionate about. When she’s not whipping ad accounts and websites into shape, Laurie is working on getting herself and others in shape. She’s a certified fitness trainer and an avid runner with 16 marathons, one ultramarathon, and numerous smaller races under her belt. That passion for health and fitness has also translated to a passion for nutrition. She hopes to write a cookbook filled with healthy, but tasty, dessert recipes someday. We’re more than willing to be her taste testers in the office! When she does take time to kick back and relax, you’ll find her enjoying a gin and tonic and a spy movie with her boyfriend, Roger; and two canine fur babies, Bobo and Blue Boy. We’re so glad to have Laurie on board and can’t wait to see all the amazing things she’ll do at E-Power. Say hello and welcome her to the team by emailing laurie@epower.com.